In this month's newsletter: new installations including with safety cage and north mounted, pitched and flush for optimum performance, $2000 Kiwi Bank grant. In this month's newsletter: Actual savings results from DairySolar, tube system as a replacement for flat panel systems, another PV system installation. 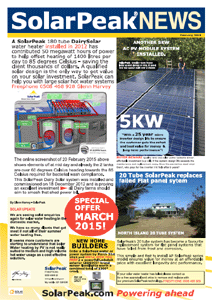 In this month's newsletter: the true cost of water heating, solar electric heating, oppertunities, install of the month. Click on the image to view the newsletter. 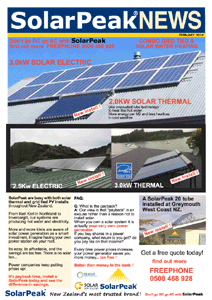 In this month's newsletter: solar thermal applications, grid tied solar electric systems, new Solar Association of New Zealand accreditation requirements. Click on the image to view the newsletter. 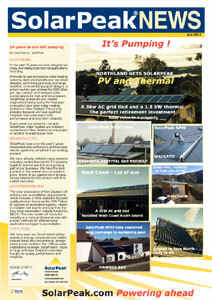 In this months newsletter combo grid tied electric and solar water heating. Click on the image to view the newsletter. 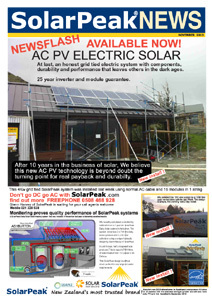 In this months newsletter read about our new AC PV Electric Solar system. We believe this is the turning point for real payback and durability. 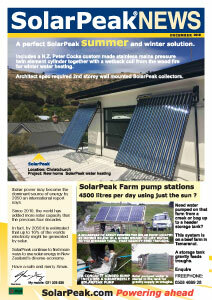 Also read how monitoring proves quality performance of our hot water solar systems. Click on the image to view the newsletter. 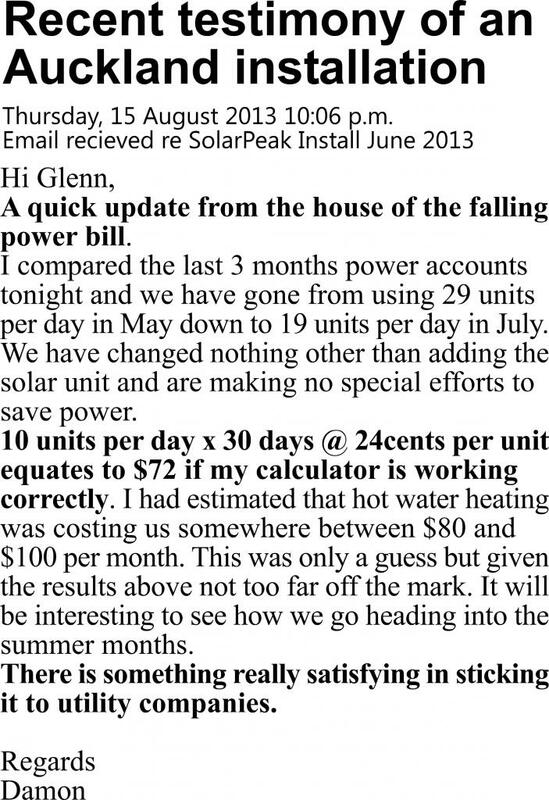 Please find attached a copy of this month’s power generated to the grid, FYI. This is despite being without power to the house for four days due to the wind storm experienced in Canterbury a few weeks ago and some very dull days. If my system keeps producing so much power, I am concerned that the Government may partially privatise me! 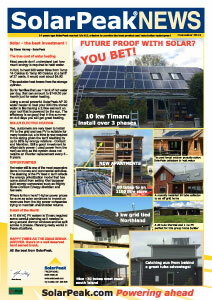 Seriously, putting in PV panels and/or solar panels on all new builds should be made mandatory under the Building Act. The new Kiwi Bank Sustainable Energy Loan allows eligible customers to pay for their system as part of their Kiwibank Home Loan. Not only do you receive the benefit of Kiwibank's home loan rates, Kiwibank will also kick in $2,000 over four years to help pay your system off faster. And with our SolarBridge Inverter and PV module combo 25 year power output guarantee, once your system is paid off it will generate free electricity for the rest of its lifetime! 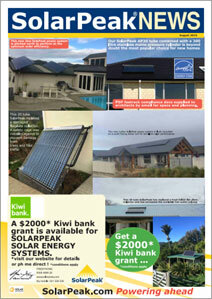 Kiwibank’s Sustainable Energy Loan can make it easier for you to get a solar power system for your home. The Sustainable Energy Loan can be included when you move your current home loan to Kiwibank, as a top up on an existing Kiwibank Home Loan or on a new Kiwibank Home Loan. Kiwibank will contribute $2,000 (over four years) towards the cost of the system and, if you’re already a Kiwibank Home Loan customer, Kiwibank will waive the fee to top up your home loan. For more information, go to Kiwibank’s website: http://www.kiwibank.co.nz/personal-banking/home-loans/already-with-us/ and click on "Sustainable Energy Loans".